RADCLIFF (Radcliffe), THOMAS, militia officer, jp, and politician; b. 17 April 1794 in Castlecoote (Republic of Ireland), eldest son of Thomas Radcliff and Elizabeth Mitchell; m. Sarah Ann Armstrong, and they had five sons and three daughters; d. 6 June 1841 at Amherst Island, Upper Canada. The Radcliffs were a prominent Irish Anglican family. Thomas Radcliff Sr was chaplain to Ireland’s lord lieutenant as well as subdean and prebendary of St Patrick’s Cathedral in Dublin. Young Thomas Radcliff was educated at Trinity College. He was not, however, attracted to the church, as several of his brothers were, but to the military. A giant of a man – most sources put him at 6 ft 5 in. and 210 pounds – he joined the 27th Foot in 1811 as an ensign, becoming a lieutenant two years later. During the Peninsular War Radcliff fought in many battles; in 1814 he was transferred to British North America where he saw action at Plattsburgh. Returning to Europe, he missed the battle at Waterloo but did participate in the triumphal march into Paris. In 1816 he went on half pay, taking up a position at the Richmond Penitentiary in Ireland where his father was chaplain. In 1832 Thomas, who had sold his half pay, his brother William, and their two families left an increasingly turbulent Ireland for Upper Canada’s Adelaide Township, west of London. As early as 31 May 1833 Radcliff was made a magistrate. He also received a militia commission, becoming colonel of his regiment in 1837. When rebellion broke out that year, he assumed command of the militia guarding the district jail and was one of the magistrates at London examining persons charged with treason. On 1 Jan. 1838 he was put in command of the Detroit frontier, then menaced by the Patriots – Canadian refugees and their American sympathizers. Arriving on the frontier, Radcliff found provisions and matériel in short supply and the militia “in a cruel state of disorganization.” Fortunately the enemy were little better prepared. On 9 January the schooner Anne, which had been firing upon Fort Malden at Amherstburg, ran aground. Radcliff ordered some of his men to wade out and board her. They did so, capturing “all descriptions of useful equipments” and 21 Patriots. 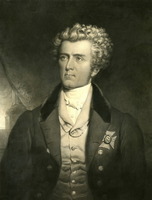 The commander of the vessel, Edward Alexander Theller*, later observed that Radcliff had ordered the prisoners be treated humanely. An attempt in early February to have the House of Assembly grant Radcliff a sword for his services proved abortive, but he was to receive other rewards. Much to the chagrin of certain militia officers about London who regarded him as a “fawning sycophant,” he was commissioned lieutenant-colonel of the 11th Provisional Battalion on 9 Nov. 1838. Then on 27 Feb. 1839 he was appointed a legislative councillor. After the revolt Radcliff moved to Port Credit. He became collector of customs at Toronto, but before he could assume his duties he died at Amherst Island while rowing a boat. The crown granted his widow £150 in recognition of his many services; none the less she and her family faced an uncertain economic future, for Radcliff had not died a wealthy man. AO, MU 2366. MTRL, James Hamilton papers. Arthur papers (Sanderson), vol.1. Authentic letters from Upper Canada . . . , ed. Thomas Radcliff, intro. J. J. Talman (Toronto, 1953). Cyclopædia of Canadian biog. (Rose and Charlesworth). C. O. [Z.] Ermatinger, The Talbot regime; or the first half century of the Talbot settlement (St Thomas, Ont., 1904). R. B. Ross, “The Patriot war,” Mich. Pioneer Coll., 21 (1892): 509–609. Colin Read, “RADCLIFF, THOMAS,” in Dictionary of Canadian Biography, vol. 7, University of Toronto/Université Laval, 2003–, accessed April 24, 2019, http://www.biographi.ca/en/bio/radcliff_thomas_7E.html.